6. 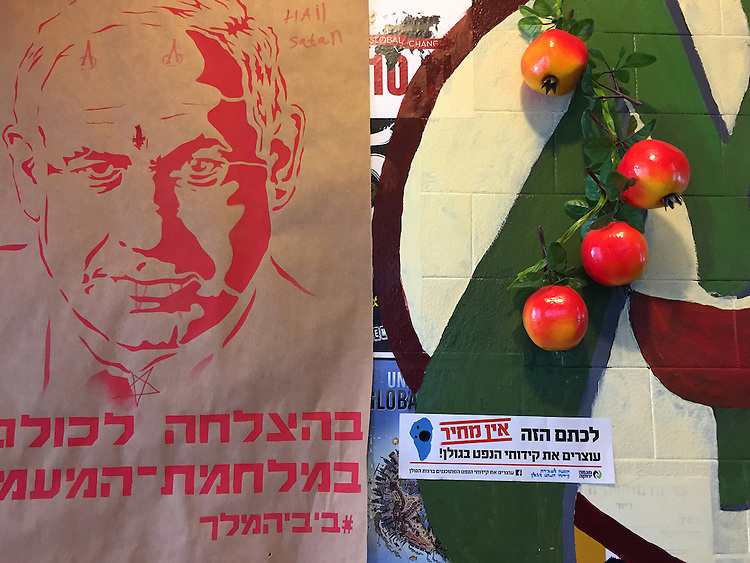 "King Bibi": defaced poster depicting Prime Minister Netanyahu, near Tiberias, Galilee. In a coffee shop festooned with political posters, this crude portrait of Prime Minister Netanyahu caught my eye. Someone had scrawled horns and "Hail Satan" on an image meant to vilify him by activists campaigning for social justice. The silkscreened Hebrew says "good luck to us all in the class warfare" followed by "hashtag Bibi the King," made more menacing by the devilish drawing. To the right, a bumper sticker depicts a map of the Golan with an ominous black hole in its center. The text says "For this stain there is no price; stop drilling oil in the Golan!" The message is sponsored by The Green Objective, an environmental action group, and artificial pomegranates hang brightly above it on the wall. One can just make out slogans on the other posters in the background. In English, they call for "global change."